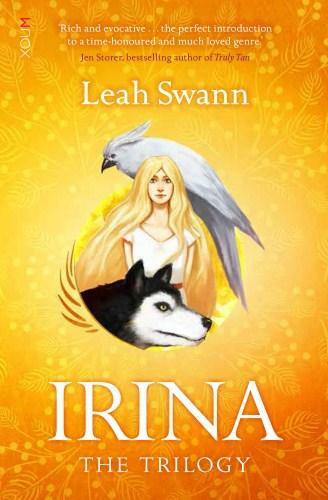 Irina is a princess, stolen at birth, raised by wolves and destined to save the kingdom. Following her own path rather than what is expected of her, Irina remains true to her loyalties and what she believes is right. She is a feisty character with great loyalty, honesty and courage. And at the heart of the trilogy lies the belief in trusting your own instincts and finding individual pathways through life. This is a beautifully written story, with fairy-tale qualities of battles, quests, wise women and evil magicians. It is new and unique, yet it feels comfortingly familiar. The characters are drawn with strength and life; they are real and likeable, filled with quirks and weaknesses. The villains are satisfyingly mean and the adventure perilous in a well constructed world. In true fantasy style, the conflict between good and evil is the centrepiece of this story and the journey is an exciting one. There are princes, princesses, wild woods, dragons, and magic all captured by engaging story telling. This is a tale worth telling and one that is already loved by many. The chapters are short, which not only quickens the pace of the story, but makes it accessible to younger or less confident readers. Little silhouetted illustrations of animals – wolves for book 1, birds for book 2, and bunnies for book 3 – break the chapters down even more. It is an engrossing read for the 8 – 12 age range. Irina is the full set of The Ragnor Tilogy; Irina the Wolf Queen, Irina and the White Wolf, and Irina and the Lost Book.